Description of "AIDS Prevention and Christian Teaching"
The book is divided in to 2 parts.1 parts explains about the scientific fact of the disease AIDS.2 part explains how Christian Teaching can be used in AIDS Prevention. The Author is a Post Graduate in Christian Studies (M.A. ).In addition he passed PG Diploma in Medical Microbiology and B.Sc.,Chemistry. 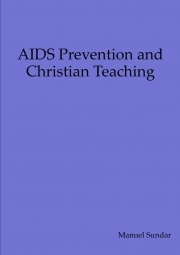 Reviews of "AIDS Prevention and Christian Teaching"